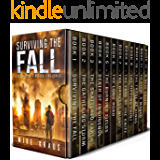 The Bestselling, Epic Post Apocalyptic Adventure, The Last Survivors - The complete series of 6 books, in one box set. Over 1,700 pages of reading! Three hundred years after the fall of society, the last fragments of civilization are clinging to life, living in the ruins of the ancient cities in medieval conditions. Technology has been reduced to legend, monsters roam the forests, and fear reigns supreme. But that is just the beginning. Through it all, a mother must protect her son. 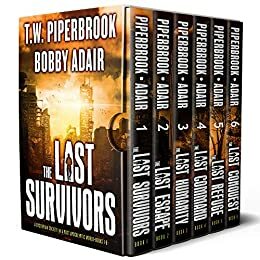 This is a Post Apocalyptic thriller box set written by authors Bobby Adair and TW Piperbrook. The title is The Last Survivors Series which includes: The Last Survivors, The Last Escape, The Last Humanity, The Last Command, The Last Refuge and The Last Conquest. As I mentioned in a review a couple of weeks ago, I used to stay far away....really far away from box sets. Now, I really appreciate them as they are in one place for finding them easily. 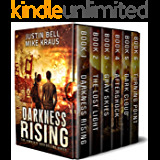 I read this series a year or two ago on Kindle unlimited and loved it. Recently I saw the whole set for .99 so I bought it and re read it. This is a great series! 5.0 out of 5 starsLots to love and hate in this gem! I've never been so invested in so many characters well being in a single story! Action packed with just the perfect amount of gore thrown into the mix to satisfy my love of horror! Please keep me posted on how you're doing with your new prosthetic feet😏. The story line flowed very well. I never lost track of what the characters were doing and where they all fit into the big picture. I was hooked on the story from the beginning. i enjoyed the first book a few months ago and decided to complete the series to see where it led. I have read quite a few of the "post apocalyptic" type of series and i must rate this one as the most credible and realistic. the characters as always, make this tale a pleasurable journey. kudos to both of you for putting your heads together on this project. 4.0 out of 5 starsGreat story, interesting!! I really enjoyed the series. I liked the way the authors developed all of the characters as the story went along. It was difficult to put the book down as I was anxious to see what would transpire next. The only criticism I have is sometimes the intricate details of every scene seemed a bit overdone and I found myself skimming over a lot of them to get back to the story. "Sorry". Still loved the series.